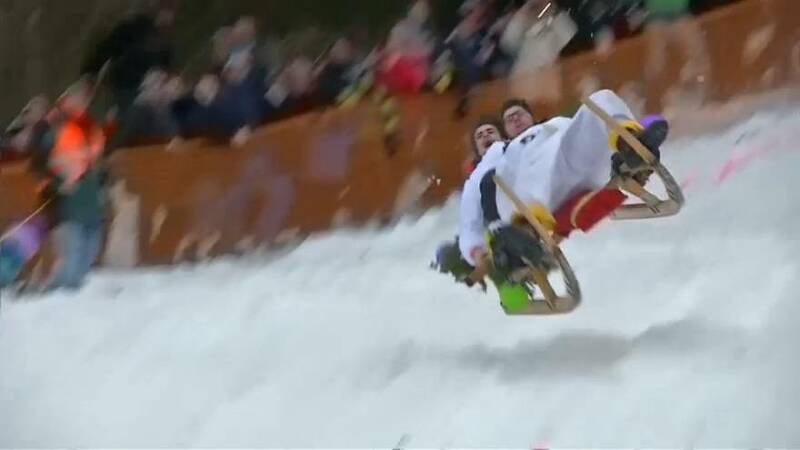 Thirty two racers dressed in colourful outfits took part in Gaissach's annual horn sledge race on Sunday (January 27), a popular event that attracts hundreds of people from all over Bavaria, Germany. Racers slide downhill through a narrow forest trail on the traditional two-person sledge, knowing the last test is a spectacular bump at the end of the race that will make most sledges crash. The tradition dates back to a bet made in 1928, when a group of 30 sledgers and 40 horn sledgers (carrying two people) bet on who would be fastest to make it to the valley through the 1.5 kilometre long trail.